Greek goldwork was not limited to the production of jewelry. Gold vessels of different shapes and sizes are known from temple inventories and from actual finds. The exact purpose of other gold objects is not always clear. 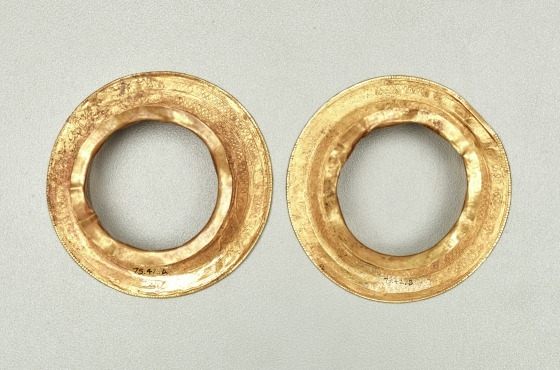 This pair of cylindrical objects may have been supports for small glass flasks, or some sort of head ornament. Each piece consists of a short cylinder, with a broad flange above and a narrow one below. 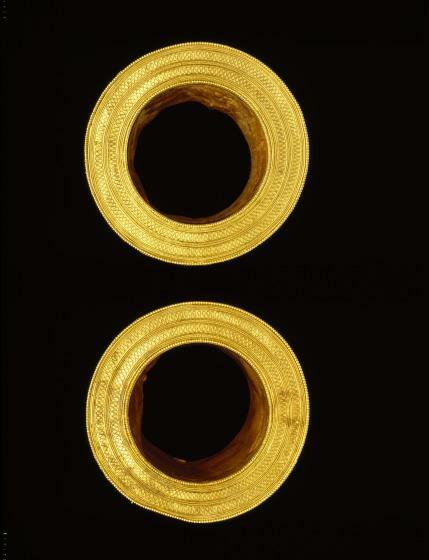 The surface of the upper flange is decorated with an undulating filigree and herringbone pattern, arranged in two registers Similar cylinders from Magna Graecia have been found, always found in pairs. Barbara Deppert-Lippitz, Ancient Gold Jewelry at the Dallas Museum of Art (Dallas: Dallas Museum of Art in association with the University of Washington Press, 1996), 67-68; 142-3. 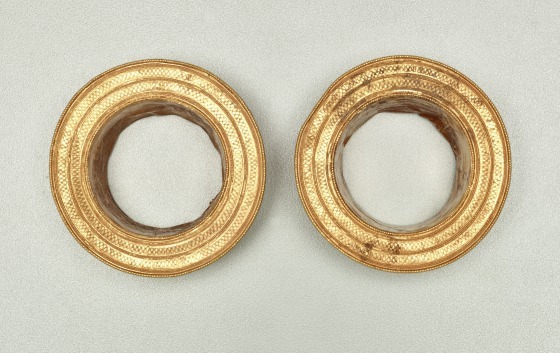 Examples of other "reels" are found in women's tombs only, and always in pairs. Internal bits of material cause some reels to rattle, perhaps as amulets.